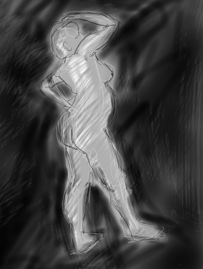 At the moment Sketchbook Pro is my drawing app of preference - it is the one that I naturally open when I sit down to draw, perhaps because it is the most versatile. It links directly with Sketchbook pro on my laptop, exports as photoshop, and creates high definition images. 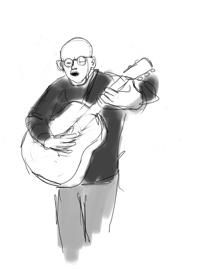 I have been using Sketchbook Pro for the last year in a weekly life drawing class, drawing quick sketches from life, and am just beginning to branch out, taking it along to the monthly acoustic music sessions that I go to, to sketch the acts - something that I used to do 30 years ago when I first started teaching art. Sketchbook pro is also the app that I mostly use for photomontage, as it has simple and powerful layering and transforming tools.